Children's author of the new George Washington’s Spies! Wonder what it was like to be a firefighter living in a firehouse with horses? Take a look at some of these photographs to get a better idea. If you’d like to know more about the lives of turn-of-the-century firefighters and their horses, check out the resources at the bottom of the page. 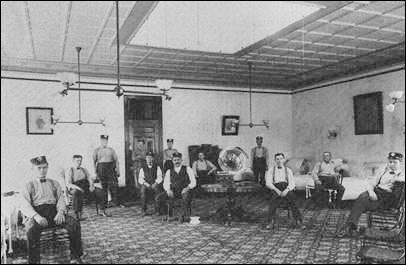 Come on in and take a look at what a 1904 firehouse looked like inside! Right after he sounded the house alarm, the watchman placed the pegs to show which men and apparatus had responded to the fire. When men weren’t fighting fires, they passed the time by cooking meals, playing games, and sleeping. The beds lined the walls next to the brass fire poles that guided the men directly to their fire rigs. The men slept in their long johns so they could quickly pull up bunker pants with suspenders and step into boots. First Floor Interior of Turn of the Century Firehouse. Notice any ghost-like horses at the front of the station? When the alarm sounded, horses left their stalls and backed into their positions in front of their rigs. Metal rods called “spiders” dropped the harnesses onto the horses’ backs. With just a buckle and a snap, the horses were ready to go! If you would like to learn about the Baltimore Fire, there is no better book than Dr. Peter Petersen’s centennial book, The Great Baltimore Fire. For all of the technical details about the Baltimore Fire check out Gary Frederick’s Fire Department Operations: A Technical Report, The Great Baltimore Fire, February 7, 1904. It is available at the Fire Museum of Maryland. The best place to experience how a turn of the century fire company operated, visit The Fire Museum of Maryland. If you would like to know more about Goliath, fire horses, turn-of-the-century fire companies as well as Engine Company 15 and the Great Baltimore Fire, read the frequently asked questions below. Apparatus – a firefighting vehicle – sometimes referred to as a rig. Steam engines, hose wagons, hook and ladder trucks and water towers were all examples of fire apparatus at the turn of the century. Back draft – An explosion caused by a sudden rush of fresh oxygen to a smoldering fire in an enclosed area where gases have built up. Company – a group of firefighters organized as a team and led by a fire officer to perform firefighting operations. Couplings – These join the fire hoses to the hydrant. The threads to the couplings of the out of town hoses did not fit the Baltimore city hydrants. This was a major obstacle in extinguishing the fire. Deadeye – Two inch round glass discs, set in the sidewalks to provide vault lights for the dark basement storage rooms directly below the city sidewalks. They discs were often cracked and rarely replaced. It is believed the fire was started by a discarded cigarette that fell through a broken “deadeye” above the Hurst building basement. Derby – A silk hat that men commonly wore in America at the turn of the century. Draft horse – Clydesdale, Shire, Belgian, and Percheron are the four breeds of draft or work horses. These are breeds that are extremely well suited for pulling heavy loads. They have even dispositions, great endurance, and they are large and strong. Dry Goods – Goods made from cotton such as towels, sheets, blankets, and clothes. Dynamite Teams – Demolition crews trained to strategically blow up areas to create expansive spaces between buildings and therefore stop the fire from spreading. Engine Company – A group of firefighters assigned to an apparatus with steam or water pumps and hoses. Exercise Run – Fire horses were required to be exercised every twenty four hours except Sundays and during stormy weather. They could go out on Sundays if they had not been called the night before. They could not be taken more than two miles away from their engine house or go faster than ten miles per hour. The driver could not stop and chat while exercising the horses. Firebrands – Pieces of burning wood that are propelled by the force of an explosion. Firehouse – A place where fire apparatus is stored and full time firefighters work. Goliath – Lead horse for Water Tower 1 at Engine Co. 15. He pulled the tower away from the Hurst building before it collapsed and prevented two other horses, the driver, the tower, and himself from being crushed. Hale Water Tower – Built in 1898 by LaFrance, the tower carried a pipe and mast that could be elevated to 55 feet to extinguish fires in the top floors of tall buildings. It required three horses to pull it. 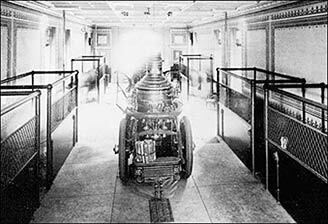 Horse-drawn steam engine – These turn of the century fire apparatus had a boiler that produced steam to provide pressure for the fire hoses. Coal was used to heat the boiler. Hose Wagon – The hose wagon carried the fire hoses which attached to the steam engines and city hydrants. Hostler – The firehouse hostler was in charge of the care of the fire horses and their equipment. He fed, watered, groomed, and exercised them. At fire scenes he kept them out of danger, covered them with blankets, and took them back to the station for more equipment. Jones Falls – A large stream over 100 feet wide that ran through the city and emptied into the “basin” or harbor at City Dock. It was bordered by stone flood control walls. Jubilee Week – September 9 – 16, 1906 was a week long celebration of Baltimore’s successful recovery from the Great Fire. The thank you parade honoring the firefighters who fought the fire took place on September 13, 1906. Last Stand – Also called the Final Stand. This was a carefully orchestrated effort by 37 steam engines, the fire boat Cataract, and countless firemen from more than 10 cities. They formed the barricade from a bridge and the east bank of the 75 foot wide Jones Falls. Despite the steady winds, this barrage from fire hoses prevented the fire from continuing east across the Jones Falls to Little Italy, a neighborhood mostly made of wooden row houses. Lead Horse – Goliath was the lead or “off horse” for the longest rig in the fleet. His position or “station” was the far right hand side of his partners, Electioneer and Decoration, so he could keep the cumbersome water tower out of the dangerous curbs and gutters. Percheron – Draft horses that descended from Arabian stallions and mares, extensively bred in Le Perche, France for strength, size, endurance, and trainability. Percherons led knights into battle in the Middle Ages. The average Percheron is over 16 hands high and weighs over 2,000 pounds. They were the most common fire horse in Baltimore at the turn of the century and the most common work horse in America in the 1800’s. Rig – Another name for fire apparatus. Hose wagons, hook and ladders, steam engines, and water towers are all examples of fire rigs. “Spider” – A metal rod holding a suspended harness was called a “spider.” The spider held the harness high above the horse’s station in front of his rig. A spring tension was released and the harness and collar dropped into place on the horse. It only took a few seconds for the firemen to hitch the horses, and the spiders then sprang back to the ceiling and out of the way. Turn Out – “Turning out” is the term used to describe the routine a fire company follows in response to a fire alarm. Typically, a company could be out the fire house doors in less than twenty seconds. Watch Desk – Every firehouse had a watch desk that served as the communications center. A register or “joker” at the back of the desk received the telegraph signal that indicated the number of the firebox making the call for help. The desk also held the book of assignments that indicated which companies needed to respond to designated alarms. 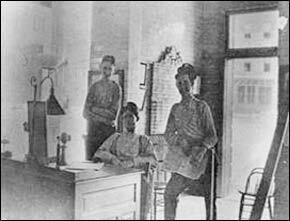 The watchman set the “running board” that was positioned on the wall next to the desk. The firehouse gong was also stationed on the wall next to the watch desk. A brass railing enclosed the desk to keep the horses from getting into important materials on the desk. Watchman – He was in charge of reading the fire box numbers as they “chopped out” on the register tape. This signal was sent by telegraph. He then sounded the house gong to match the number on the firebox that had been pulled. He then set the running board to show which apparatus and company men were on a run. He also inspected the equipment and announced visitors by ringing a fireman’s signal on the small house bell (Women were not allowed in fire houses). The Great Baltimore Fire took place on Sunday, February 7, 1904. Firefighters had it under control late the next day, Monday, February 8. Gary Frederick, Baltimore fire historian, called the conflagration an “urban forest fire” with circumstances that would challenge even modern day firefighters. The rapid and shifting winds, wooden construction, narrow streets, and the obstruction from overhead electric and trolley wires provided the firefighters with an impossible task as the flames spread in all directions. It was later determined that the explosion in the Hurst Building was caused by a back draft when the first firemen on the scene axed down the front doors and rushed inside to put out the fire that had started in the basement. It is guessed that a cigarette or match that had been discarded on the sidewalk, perhaps the day before, found its way through a broken glass sidewalk tile known as a “deadeye.” It smoldered in a crate of cotton goods below for many hours. This allowed gases to build – it was like a bomb waiting to explode when fresh oxygen poured into the building. It is unlikely the fire would have started had there been a guard on duty. Firemen came from companies from theses cities: Baltimore, Md., Roland Park, Md., Westminster, Md., Washington D.C., Atlantic City, N.J., Philadelphia, Pa., Phoenixville, Pa., Harrisburg, Pa., York, Pa., Allentown, Pa., Chester, Pa., Wilmington, De., and New York City, N.Y.
56 fireboxes were pulled during the Great Fire. 70,000,000 gallons of water were used to extinguish the fire. $100,000,000 in property was destroyed. 2,500 businesses burned and 35, 000 people were out of work as a result of the fire. 20 banks, 8 hotels, and 7 newspaper plants were destroyed. No deaths occurred during the fire; however, 4 firemen later died of pneumonia and tuberculosis as a result of the fire. There were no broken bones, but 247 firemen suffered injuries – mostly eye injuries. Only 7 houses and 1 church were destroyed in the fire. The Fire Alarm Telegraph, water supply, and fire machinery worked without fail through the entire disaster. No. 15 Engine and No. 2 truck were the only two fire apparatus (fire trucks) destroyed by the fire. Both were destroyed by falling brick from the Hurst Building and by the extreme heat of the explosion. Universal 2 1⁄2 inch couplings were developed across the nation after out of town fire fighters could not attach their couplings to Baltimore’s fire hydrants. Architects learned to design city buildings without wood exposures and with stronger windows to prevent the spread of fire. More fire houses were added in downtown Baltimore. Better water mains with increased water flow were developed. More fire engines were ordered in the city. Goliath joined the fire service on July 13, 1899 at the age of six. Nothing else is known about Goliath before February 4, 1904, the first day of the Great Fire. It is documented that Goliath’s name was fitting as he was unusually large standing seventeen hands high and weighing 2,000 pounds. After Goliath was severely burned from the Hurst & Co. explosion, he was taken to the veterinary hospital at Hook and Ladder’s No. 10 station where he recovered after six months of care from Dr. Joseph Heagerty, the Department Veterinary Surgeon. 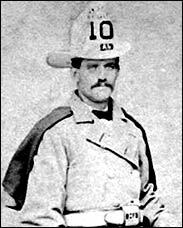 Goliath died at the age of twenty on the morning of June 13, the day after he fell sick in his stall at Engine Co.15. A funeral was given for the most famous horse in Baltimore’s history. A horse lover, Miss Minnie Brown, offered to have him buried near the stables of her family’s estate, Stoneleigh Villa in Towson, Maryland. A neighborhood has replaced the property and Goliath’s exact burial sight is unknown. A drill master took up to two years to train fire horses. Only one in a hundred would pass the requirements for the dangerous and rigorous job of a fire horse. Draft horses, usually Percherons, were bought at four or five years of age and lived and worked at the same fire station for four to eight years. Each horse had his own number with the fire department. Only one draft horse out of one hundred passed the requirements to be a fire horse. Horses that were not trainable were returned to their owners. The drillmaster trained the fire horses in the fire house where the horse was assigned. Training could take up to two years. Fire horses had to be fast, large, strong, obedient, agile, and fearless. They had to remain calm in the midst of danger and chaos. Fire horses were trained to ignore distractions from people, animals, and severe weather. Each fire horse was assigned to a specific position on a rig. Fire horse stalls were situated on the side of the fire house next to their “work station” or position on their rig. Fire horses wore bridal bits at all times except when eating grain to hasten the hitching speed when the house gong sounded. Fire horses stood in their stalls at all times unless they were being exercised or out on a call. Percheron draft horses were the most common fire horse in Baltimore and the most common work horse in America in the 1800’s. Percherons descended from Arabian stallions and mares from Le Perche, France. They were known for their strength, size, and their ability to be trained. When fire horses’ careers were over, they often became work horses that pulled delivery wagons carrying milk and heavy supplies. It was not uncommon for retired fire horses pulling delivery wagons to take off running to a fire scene after hearing the ringing of the fire bells. The company hostler was responsible for the care of the company fire horses. Hostlers were the first men up at the station. At 5:00 a.m. they cleaned out stalls, fed the horses, scraped their hooves, checked their feet for nails, stones, and loose shoes. They washed their mouths and nostrils, cleaned bridles and harnesses. They washed the tile walls and concrete floors of the stalls. At the scene of the fire the hostler unhitched the horses from their rig, removed them to a safe place, cooled them down by walking them, and covered them with blankets. 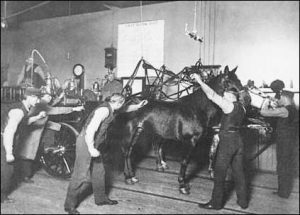 When it was time to leave the fire scene, the hostler hooked up the horses to their rigs, returned them to the fire house, and helped back them into the firehouse. The horses and equipment were taken care of immediately after returning from a fire to prepare for the next call. The equipment had to be cleaned and hoses were changed if necessary. The horses were sponged off and dried, covered with a blanket, and given sips of fresh water. Engine Company 15 was at the north side of Lombard St. and west of Howard. It was a double wide house meaning it housed two engine companies, 15-1 and 15-2. 15-1 consisted of a steam engine and a hose wagon. 15-2 had a steam engine, a hose wagon, and a water tower. Captain John Kahl was the company commander. Mark Hill was the company hostler. There were probably fourteen or fifteen horses stationed at Engine Co. 15. Eugene Short was a pipeman and driver of the Hale Water Tower. 25 members were assigned to Engine Co. 15 but only 22 members fought the fire. The company was in service for 55 hours and manned 9 different positions. Engine Co. used 4,000 feet of hose and lost 3,000 feet. The loss of hose was one of the greatest problems in fighting the fire. Tile walls and concrete floors in the fire house were easy to clean. The rigs were stationed front to back down the middle of the long fire houses. The horse stalls lined the outside walls next to the rigs. Brass poles descended from the upstairs living quarters down to a position right next to each rig. The top of the brass poles were next to the bunks of the firemen who manned the rig directly below. Spiral staircases took up less room in the fire house and also prevented the horses from going upstairs. The second floor living quarters provided bunks, a kitchen with a large table, and sometimes a seating area. Fire boots stood at the end of their bunks. The third floor housed hay bales, food, and supplies so rodents could not reach them. A pulley system delivered supplies to the lower floors. Engine seats and Tillerman seats had a heavy leather strap and snap to serve as a seat belt to keep drivers in their seats on their wild rides. Most rigs had a brake pedal or a rod that extended across the floor board. The driver kept one foot on the brake at all times. Serious accidents were not uncommon for fire apparatus. Brass bells were rung or pushed by a pedal to serve as a siren to clear the streets. The following rigs (apparatus) were stationed at Engine Co. 15. Included is the number of horses needed to pull them. Horse hitching routine: The house alarm sounds. The battery operated locks on the horse stalls known as the “cut – loose trip” or “Horton Trip” invented by Fire Chief George Horton, automatically open. The horse quickly moves from the stall to the front of his rig and backs into position under the hanging “spider.” These hanging metal rods officially known as the “Berry Patent Hanging Harness,” held the harnesses and collars above the horses so they could drop down on their backs and be secured in only two motions by a fireman. This procedure only took a few seconds. How the fire alarm system worked: Most of the buildings in downtown Baltimore in 1904 were equipped with the Baltimore National Automatic Fire Alarm System. This connected all boxes to the Baltimore City Fire Alarm Office in City Hall by telegraph. When a fire occurred, a small hammer attached to the box was used to smash the glass in order to pull the lever inside that sends a telegraph signal that matches the number of the box to the main headquarters at City Hall. 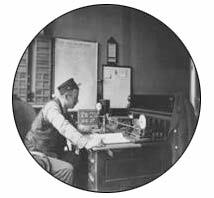 Headquarters then sends the signal by telegraph to the registers at every firehouse. The number of the fire box is “chopped out” three times in cut triangles on the paper reel at the back of the desk. The watchman on duty checks the book of assignments, and if his company is listed as a responder to that call, he sounds the house gong and the men and horses in that company “turn out”. The watchman on duty then sets the running board. 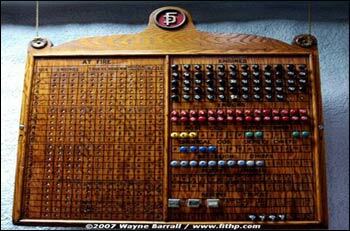 This was a wooden board mounted on the wall that had numbered and painted knobs that identified every apparatus and fireman that was on a call. Firefighter habits: fire fighters slept in beds on second floor of the fire house next to the brass pole that led him to his station on his rig below. 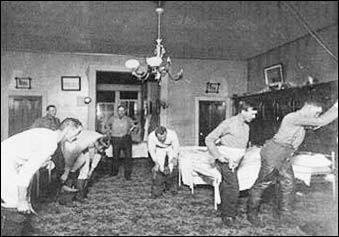 A fire house could have up to fifteen calls per night so they slept in their long underwear. Their boots stood at the foot of their beds so when the gong sounded, they could jump into their boots, pull on their “bunker pants” which were pants with suspenders, and they were ready to slide down the poles and put on coats and fire hats. House Cats: boys who helped do chores around the fire houses. They cleaned stalls, swept floors, prepared lanterns, and did errands. Fire dogs: Dalmatians were the most common fire dogs during the era of horse drawn fire engines, but other breeds lived and worked in the fire houses as well. The dogs had a calming effect on the horses, they were excellent watch dogs for the apparatus, and they ran ahead of the engines to clear the streets of people and animals. Dalmatians were able to run twenty to thirty miles in a day. Firehouse visitors: Children often visited the fire companies bringing apples, carrots, and sugar cubes to feed the horses. Sometimes children were allowed to ride along in the exercise wagon with the firemen. Women and children were not allowed inside the fire house. Each fireman had a number that the watchman could signal on a small house bell so they could receive visitors out front.